Her most recent work, Maze - 2010, an installation and video work, is a reflection of the labor-intensive practices of her parents’ new working situation after immigrating to America. Maze revolves around the social and cultural aspects of life in America through the lens of a Korean immigrant family living in the US. For the past few months, Hyeon accumulated large amounts of shirts left behind at dry-cleaners around the Chicago area. 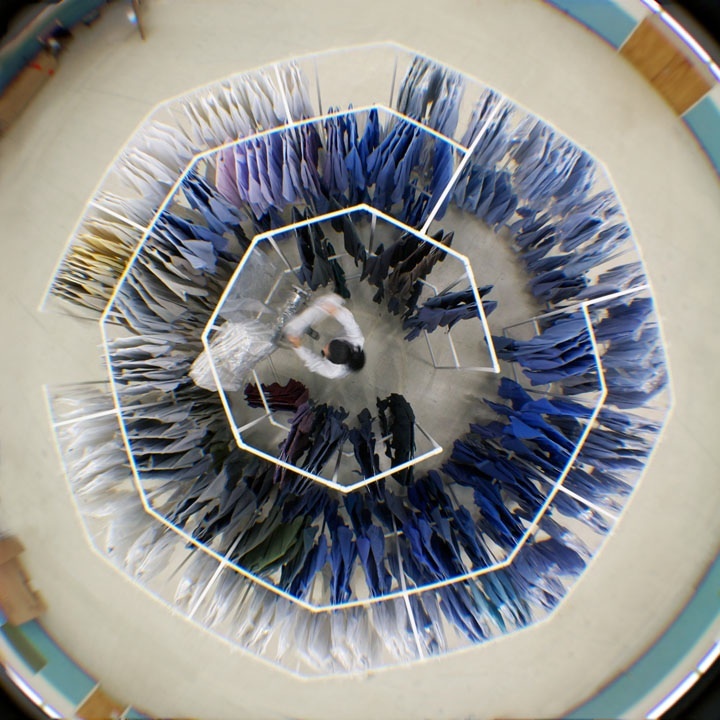 In her video, she travels throughout Maze putting dry-cleaning bags on every shirt to explore how labor and physical objects can hold the stresses of everyday life, as well as the public perception of this type of work. Many immigrant families come to the United States to pursue the American Dream of owning their own business and creating a successful family life. Many times, however, the burden of maintaining success in the family business gets passed from the parents to their children. Even though Hyeon’ s parents were a teacher and an engineer in Korea, when they came to the US they found themselves unable to pursue these careers and opted for started a number of small businesses, finally settling on a family-run dry-cleaning store. The washing, drying, pressing, and delivering of clothes involves a variety of materials and labor patterns that Hyeon has constantly been exposed to throughout her life in America. In Hyeon’ s art practice, much like her parents business, she engages in her own repetitive process with similar intensity towards the transformation and treatment of objects and materials. This process gives her time to reflect on the issues being brought out in the work, and also exposes her to the meditative state of its production. This dual focus on material and process is a way for her to embed something intangible, like the energy of labor or personal memory, into an art object.